Moran Edwards Asset Management is comprised of 26 professional staff members covering a wide range of disciplines, including investments and retirement planning, as well as meeting the unique needs of high-net-worth individuals. We also work with family offices collaborating with our clients' legal, accounting, trusts, and other specialty advisors to seamlessly integrate their investment portfolio. Teamwork is intrinsic to the Moran Edwards approach in pursuing your financial objectives, from our very first meeting you will benefit from a team that applies many years of collective financial experience to the serious business of managing your investments. Once clients have entered into an investment advisory program agreement, the Portfolio Manager acts within the capacity of a fiduciary. As stated in the video these fiduciary duties are outlined in the SEC Investment Advisers Act of 1940. Please carefully review the Wells Fargo Advisors advisory disclosure document for a full description of our services. The minimum account size for this program is $50,000. 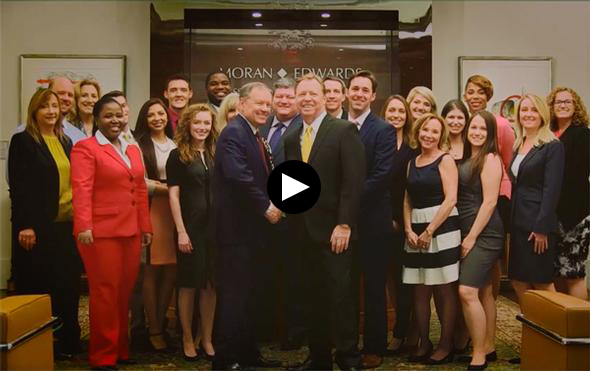 Take a few minutes to get to know the Moran Edwards Asset Management and our Senior Portfolio Managers, Thomas Moran and Robert Edwards, and hear from our team about the importance of developing lasting relationships with our clients. At Moran Edwards, we take our fiduciary duty seriously, always striving to act in the best interest of clients. We hold ourselves to very high standards, and trust is an asset clients have come to expect from us over the years. The team at Moran Edwards is like a family, our loyalty to one another and to our clients unwavering. We're proud to have a diverse team of multidisciplinary professionals and the ability to serve multi-generational clients. A portfolio manager who knows you and your goals is an invaluable asset, and we understand that choosing someone to manage your money is an important decision. Our approach to designing each portfolio is specific to the client. We diversify risk with multiple strategies, rejecting a one-size-fits-all approach and working with you to establish an appropriate asset allocation that meets your unique investment goals. Moran Edwards Asset Management was founded in March of 1990 by Thomas M. Moran, Founder and Chief Executive Officer and Earl Sistrunk, CFA, Director of Trading. From the beginning, the group has focused on quantitative analysis and fundamental research in building diversified equity portfolios for their clients. Moran Edwards now consists of 26 individuals, including three principal members, with a combined experience of over 100 years in the securities industry. The group has two Portfolio Managers and is headed by Senior Portfolio Managers Thomas Moran and Robert Edwards. Earl Sistrunk and Christina Shaw are also responsible for several of the group's portfolio strategies. Doing the right thing is the center of our investment philosophy, we believe in long-term relationships and strive to earn your continued trust. We take a disciplined and personal approach to managing your money, and our clients enjoy the individual attention that is the hallmark of Moran Edwards. As part of our client services, we provide comprehensive investment and retirement-plan analysis, equity research-screening, and portfolio-management services. Learn more about our practice's beginnings and how we've grown to be responsible for $3 billion in assets as of December 31, 2018 for families and institutions in 50 states. Schedule your complimentary consultation with a Moran Edwards advisor, where we will discuss your current finances and future goals and provide you with a customized proposal for meeting your investment needs. Discover our full suite of financial services, including investment planning, retirement-plan analysis, investment research and screening, and portfolio-management services. More than 40% of homeowners 65 and older had mortgage debt on their primary residences in 2016, up from 22% in 1995, according to the Joint Center for Housing Studies in Harvard University. The Social Security Administration announced (October 11, 2018) that 63 million beneficiaries, including retirees, disabled workers and their eligible dependents and surviving family members, will receive a 2.8% increase in benefits next year, the largest annual cost-of-living adjustment since 2012. Check back each week for the latest insights into the financial industry. We'll cover a variety of topics and current events that really matter to our clients, such as: stock market and investment news, wealth management, investment planning and budgeting resources, labor statistics, economic surveys, retirement planning, and much more. Follow Moran Edwards in the news to learn about the group's latest awards and accolades, promotions and new hires, and the team's philanthropic work throughout the Naples community. Our broker-dealer name has changed. We are in the process of applying the new name and disclosure (shown below), throughout our site. This information is intended for use only by residents of (AK, AL, AR, AZ, CA, CO, CT, DC, DE, FL, GA, HI, IA, ID, IL, IN, KS, KY, LA, MA, MD, ME, MI, MN, MO, MS, MT, NC, ND, NE, NH, NJ, NM, NV, NY, OH, OK, OR, PA, RI, SC, SD, TN, TX, VA, VT, WA, WI, WV, WY). Securities-related services may not be provided to individuals residing in any state not listed above. Please consult with the FA as s/he may not be registered in all states. Insurance-related services may not be provided to individuals residing in any states other than (FL, IL, MA, MN, MO, MS, PA, RI). Investment and insurance products: Not Insured by FDIC or any Federal Government Agency May Lose Value Not a Deposit of or Guaranteed by a Bank or Any Bank Affiliate Investment products and services are offered through Wells Fargo Advisors. Wells Fargo Advisors is a trade name used by Wells Fargo Clearing Services, LLC, Member SIPC. ©2017 Wells Fargo Clearing Services, LLC. All rights reserved. Barron’s Top 100 Financial Advisors: Criteria was based on thousands of filtered nominations from investment, insurance, banking and other related firms, which were narrowed down by quantitative and qualitative criteria as well as by examining regulatory records and talking with peers, supervisors, clients and the advisors themselves. Portfolio performance is not a criterion because most advisors do not have audited track records. Barron’s Top 1,000 and Top 1,200 Financial Advisors: The rankings are based on data provided by thousands of advisors and financial services firms. Factors included in the rankings were assets under management, revenue produced for the firm, regulatory record, quality of practice and philanthropic work. Investment performance isn’t an explicit component. Financial Times Top 400 Advisors: Rankings are based on data provided by investment firms. Factors include assets under management, experience, industry certifications and compliance record. Investment performance and financial advisor production are not explicit components. 2016 Forbes Top Wealth Advisors: Ranking algorithm based on industry experience, interviews, compliance records, assets under management, revenue and other criteria by SHOOK Research, LLC, which does not receive compensation from the advisors or their firms in exchange for placement on a ranking. Investment performance is not a criterion. 2016 WealthManagement.com Top 100 Wirehouse Advisors: list is based solely on assets under management. Only those advisors for whom 80 percent or more of assets correspond to retail clients were eligible for the list. Lipper Marketplace Best Money Managers are compiled from a quarterly survey of investment management organizations and portfolio composites. Performance is calculated “net” of all fees and brokerage commissions, inclusive of cash and in U.S. dollars. Results calculated on a minimum asset base of at least $10 million for “traditional” U.S. asset classes (equity, fixed income, balanced accounts) and $1 million for all international and for “alternative” U.S. asset classes. Only categories/time period combinations for which there are at least 20 contenders are published. Past Performance is no guarantee of future results. Not all of the multiple strategies submitted by The Moran Edwards Asset Management Group may have been selected for the Lipper Marketplace published list of Best Money Managers. This information is intended for use only by residents of (AK, AL, AR, AZ, CA, CO, CT, DC, DE, FL, GA, HI, IA, ID, IL, IN, KS, KY, LA, MA, MD, ME, MI, MN, MO, MS, MT, NC, ND, NE, NH, NJ, NM, NV, NY, OH, OK, OR, PA, PR, RI, SC, SD, TN, TX, UT, VA, VT, WA, WI, WV, WY). Please consult with each individual Financial Advisor listed on this site to understand what states they are licensed to transact business.